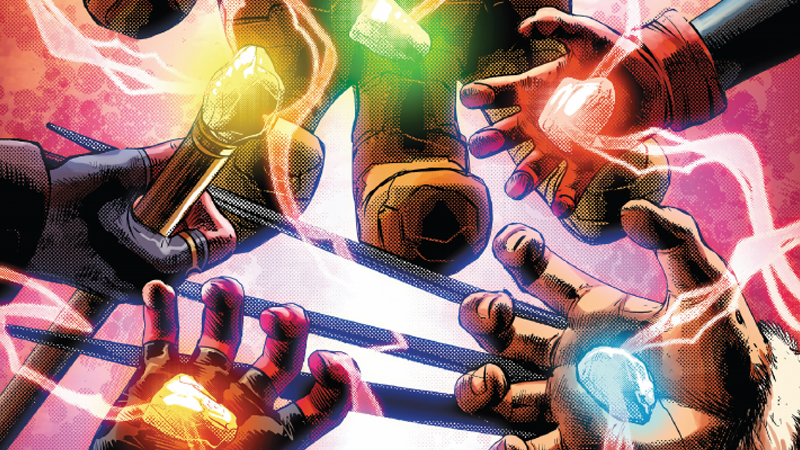 This week, Marvel truly began teasing Infinity, its next big cosmic, Infinity-stone-powered comic book event. But in the process, it also jokily offered an Easter egg that links not just two upcoming superhero blockbusters, but the entire Marvel Multiverse to the one occupied by DC Comics. Sort of. This week's Infinity Countdown Prime, from Gerry Duggan, Mike Deodato Jr, Frank Martin and Cory Petit, does a lot of setup for what's to come in what will eventually be Marvel's big event series for the year. This time, instead of superheroes fighting each other or extremely unwise stories about fascism in the US, Infinity is about the return of the Marvel cosmos' greatest threat, the Infinity Stones. 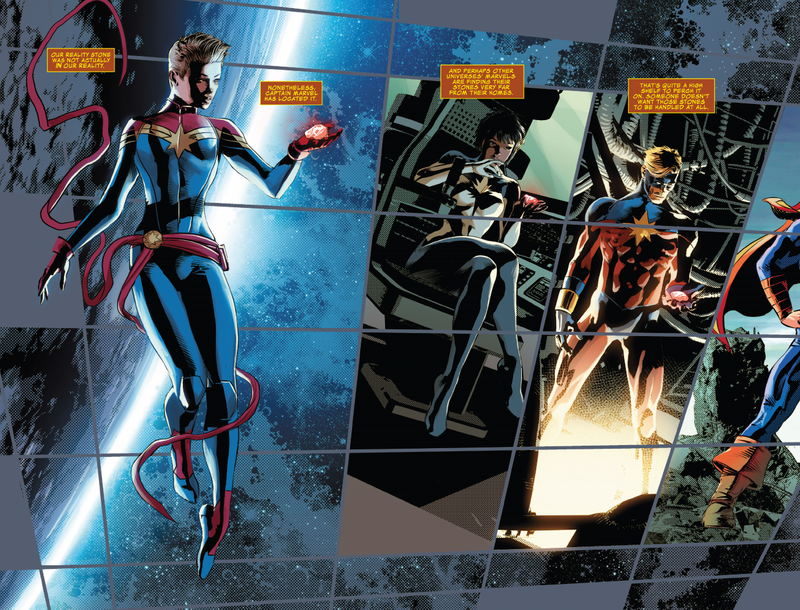 Countdown Prime is essentially all about putting everything into place and letting us all know where each stone is in Marvel's multiverse at large, and more importantly, who has them - and who's after them. A quick recap: Logan has had his hands on the Space stone for a while, the Mind stone is currently on Earth, the Nova Corps is in control of the super-plus-sized Power Stone, the crazy Hank Pym/Ultron Hybrid has the Soul stone, Kl'rt the goddamn Super-Skrull is back and has the Time Stone, and the Captains Marvel have the Reality Stone. The colours are different, and we don't get to see that much of the mystery figure, but the costume is obvious to keen-eyed comic fans. That boot, that half-cape, and especially that wristband... remind you of anyone? The history of the Captain Marvel characters of DC and Marvel Comics is fairly well-known at this point. The character formerly known as Captain Marvel was first created by Fawcett Comics in the 1940s, but DC Comics - at the time named National Comics - sued Fawcett, arguing that Captain Marvel was a copy of Superman, leading to the character being put on ice. Eventually, DC licensed the Captain Marvel family of characters from Fawcett (and as of the '90s, officially owned them), but in the time between that Marvel capitalised on the character name being in limbo and launched its own Captain Marvel comic, an entirely separate character that began the legacy we still see today with Carol Danvers. 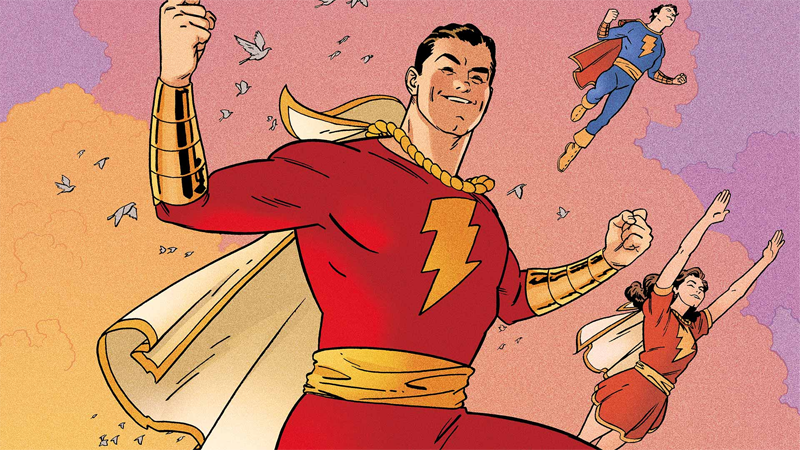 Since DC brought Fawcett's Captain Marvel into its comics in the '70s, it had to brand the character under the name Shazam, ultimately making that the name of the character outright when DC launched its "New 52" reboot in 2011. Now, both characters have movies coming out in 2019, which is a wonderful confluence of coincidences, but right here in 2018, they also sneakily shared a splash page together in a Marvel comic. Kiiind of (insert overly dramatic wink here). It's a cute little way to acknowledge the very long and very weird history behind the Captain Marvel name. The colors make it look more like Captain Marvel Junior than the Big Red Cheese himself. And junior is even on the image you linked! It's actually been previously established by Marvel that all fictional universes - from their own to other comic companies, movies, TV shows, etc - are part of a single Omniverse.